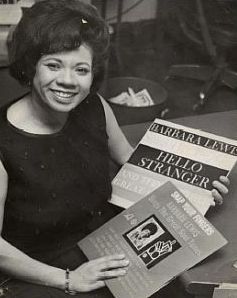 It took a while for Barbara Lewis to move away from her steady perch of organ driven cuddly early 60’s R&B. Like any a number of her peer Soul Chanteuses, she had a streak of fondness for soft Jazz-Pop ladies of a generation before her. Those women last named Vaughan, Ennis, Washington and Fitzgerald were seminal influences on how they’d bridge the gap as Soul music developed. Quite often that meant at least one slow burning ballad meant for nightclubs was made during their trips to the studio, as often their live sets contained them as well. It wouldn’t be until her 1966 LP It’s Magic that Barbara went full fledged into a “Supperclub” vibe, but this Fall of ’64 ballad was her first solid shot at showing her versatility off stage and in the studio. Her voice had been already well regarded as one of the best tender interpreters in R&B during the early 60’s. This loving, longing candlelit prayer sweetened with the most judicious use of saxophone and strings is a sterling example of what would have been a possible direction for the 21 year old Lewis to take her career. It’s actually surprising that none of her other attempts at Top 40 hits mine this territory given her discography is pretty diverse.